Join us in this exclusive audio program for candid conversations with luminaries in the food world. 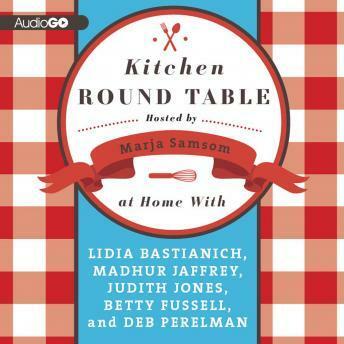 Kitchen Round Table brings you inside the homes and hearts of Lidia Bastianich, Madhur Jaffrey, Judith Jones, Betty Fussell, and Deb Perelman. We hear about their earliest food memories and how each slowly made their way into the kitchen and ultimately inspired generation upon generation of home cooks. We'll learn how complicated recipes are translated for those of us who don't dice and julienne in our sleep, but we'll also hear about memorable gourmet feats and culinary fireworks, and unforgettable meals. All the while, Kitchen Round Table never strays far from home, with intimate and loving details of recipes passed down through families and new recipes introduced to successive generations. After a long day at work, what do these renowned cooks prepare at home? It is at home that some of the best food is created. With frugal sensibilities, these gourmet greats tells us some of their favorite dishes created on a budget and entice you to explore your own. Hosted by Marja Samsom, owner of the iconic Kitchen Club restaurant, a downtown New York City destination for 20-years, Marja prepares for us one of her loved family recipes as a desert for this delicious audio feast.